After another scorching week of crop-scorching weather the heavens opened last night with a most breathtaking thunderstorm. At one stage our terrace turned into a river with water running in a torrent down it, Roddy was wondering whether to spey-cast across the stream for newts and frogs. By 4am the thunder had ceased and poor Bentley finally stopped shivering with fear – at dawn the odd down-pour still persisted but the garden had hungrily soaked up every drop of water and sat there contentedly in the weak sunshine, glistening like a frog with a fat stomach. Everything looked that little bit greener finally after such a dry summer, and after a week of sand and sea, boating and swimming, it was time to spend some time locally again. 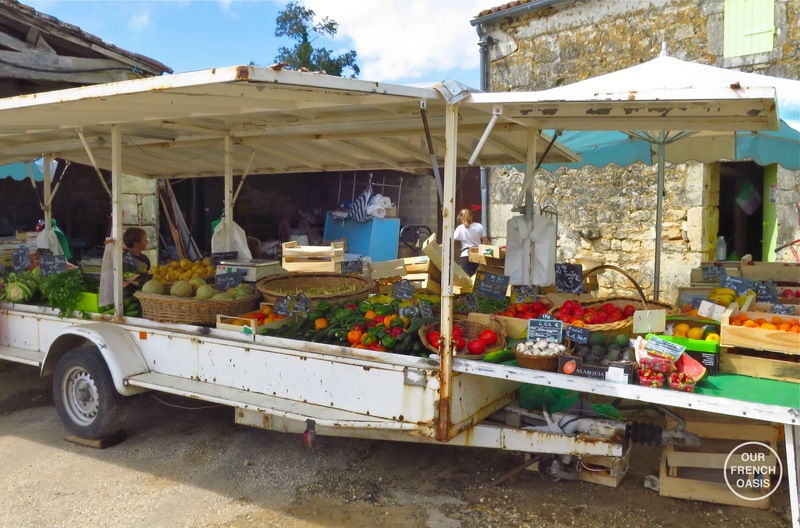 We searched for unused raincoats amongst the cobwebs in the boot-room, and headed off to the Fête des Battages in Trizay, not entirely knowing what to expect except that it was a threshing festival and a real old fashioned farmers market! By the time we arrived we didn’t need them anyway as the heavy black clouds had completely retreated and once again blue sky was visible. 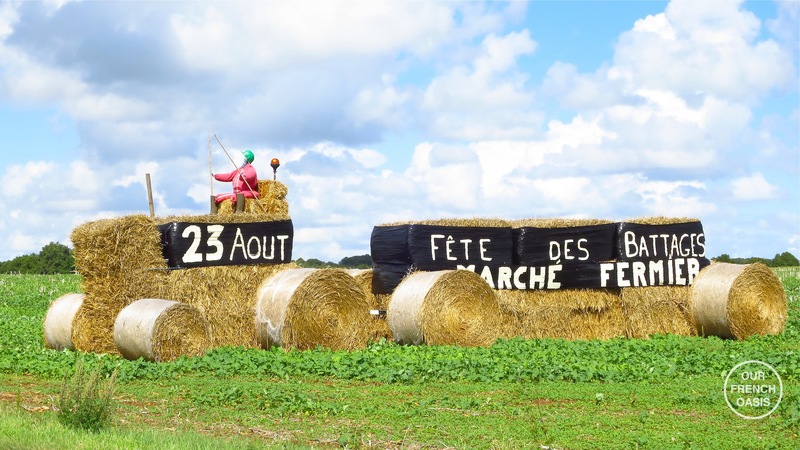 We hoped the ‘agriculteurs’ would be in good voice, despite the dreadful forecast for the maize harvest which apparently is going to be one of the worst on record here after the lack of water. On display at the fête was an old threshing-machine from the 1950’s and not long after we arrived they fired it up and demonstrated how it worked, much to our delight. 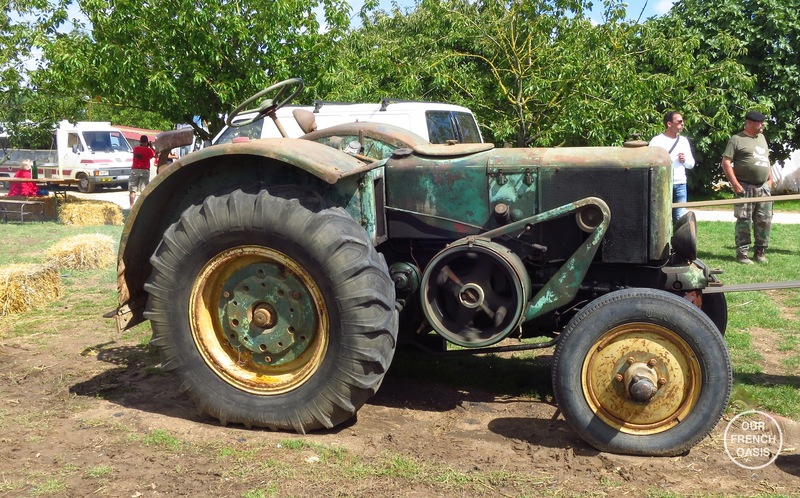 An ancient granny of a tractor served as a power source, and a drive-belt snaked some 30 feet to the threshing machine, driving in turn a spiders-web of belts, pulleys and baffles – Heath Robinson would have been proud. How much incredible hard work the harvest used to be, and how much more dangerous. 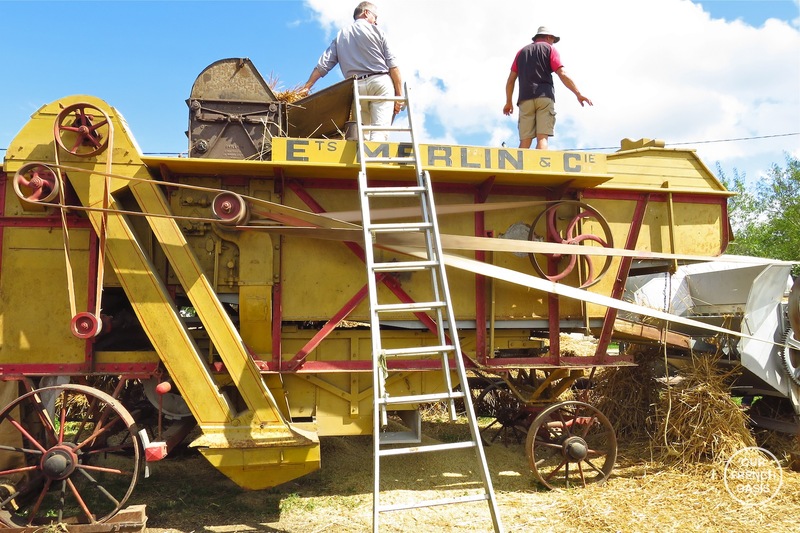 After the corn had been cut it was tied into bundles and then passed by hand into the threshing machine which sorted the grain from the stalks. 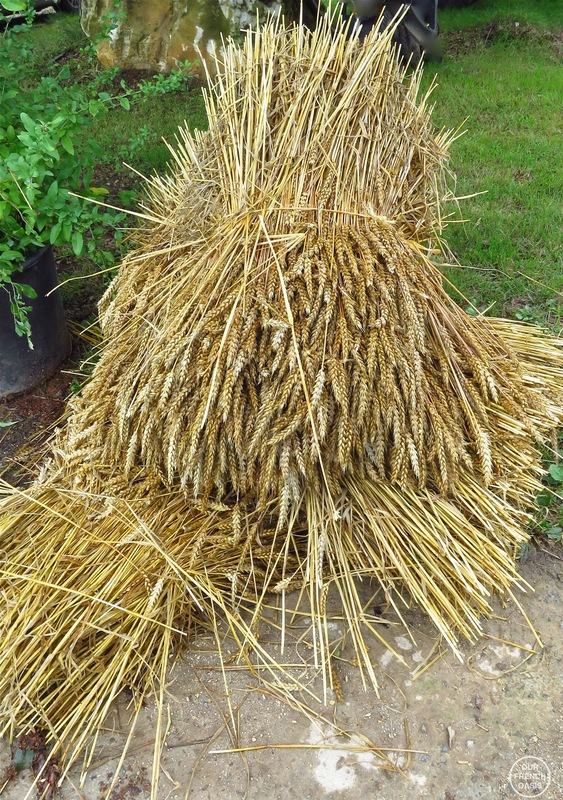 The grain was gathered at one end in bags, the chaff gathered underneath, and the straw came out the other end were it would end up passing through an attached baling-machine. Hetty and Gigi were engrossed for a good half hour, and it seems the rest of the crowd were too. We had to drag the children away eventually. 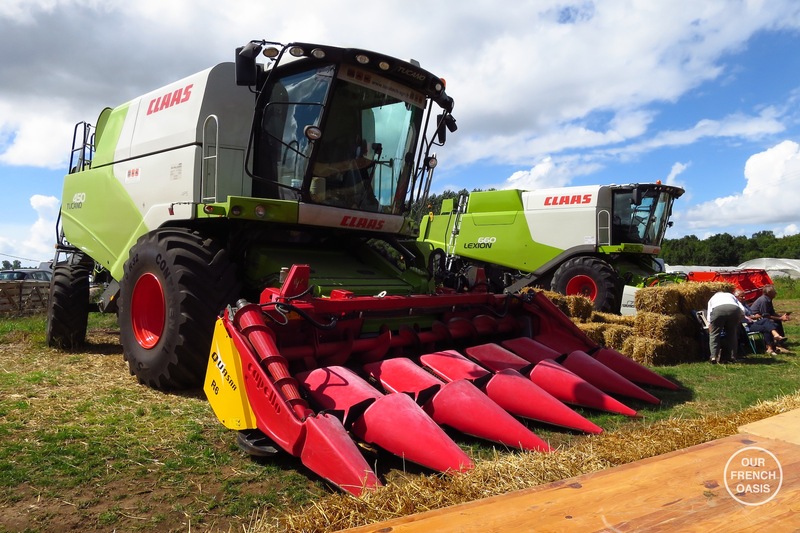 Modern day combine-harvesters (or simply ‘combines’) operate on the same principles and use the same components as the original threshing-machines built in the 19th and early 20th centuries, but they also perform the reaping operation at the same time. The name ‘combine’ is simply derived from the fact that the three steps are combined in a single machine, something many people simply gloss over. Growing up on a farm, I remember harvest-time as one of the best parts of the summer. Our bales would come out in rows of three with another three on top. If the weather looked fine, my father would always leave them out for a couple of extra days for us, and we used to canter around the fields on our ponies jumping them; there was only one rule – if we knocked one over, we had to get off and pick it up. We take modern farming methods for granted, but in the 1900’s everyone saw so much change. My father grew up on his in family farm in Sussex, he was born in between the two world wars and he saw all of this great change, which included horses being replaced by tractors, and then the step up to modern-day farm equipment. I remember him upgrading our bright red Massey Ferguson ‘combine’ for one with an enclosed cab; aside from cutting out the dust the cab was also silenced and this in turn meant he could listen to the cricket whilst combining – a vital part of an English summer! In fact, today somewhat resembled an English summer day; the temperature stayed in the low 20’s (mid 70’sF) and white clouds scattered like Sussex hens across an otherwise blue sky due to the cooling breeze. A British friend who stayed with us last month remarked that she never remembers bad weather in England as a child in the summer holidays; of course it rained, but I similarly don’t recall the rainy days either – just endless sun, picnics, riding ponies, harvest-time, playing tennis and of course cricket; there was surely never any rain? Anyway, on that note I wish you all a very happy week ahead with plenty of sunshine hopefully for the last week of August. What a other fab Blog Sue. Poor Bentley though. Had a horrendous storm here as well and Bella like Bentely couldn’t cope with it. Terrified so fed her biscuits, off the bed, on the bed she was in a right turmoil!! 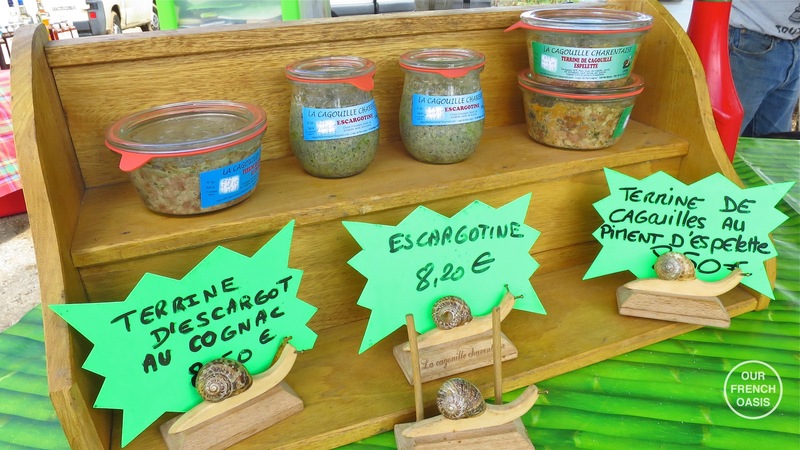 So lovely to have met you and Roddy at Chez Maurice and hope we can meet again soon. Hi MC, it was great to meet you too and we both really hope we see you again soon, so much laughter, it was so good. These poor dogs in storms, the puppy couldn’t care less but Bentley is always terrified and sleep becomes impossible as he pants so loudly – a little weary tonight! Another treat to visit the threshing festival with you!! !